A digital print. 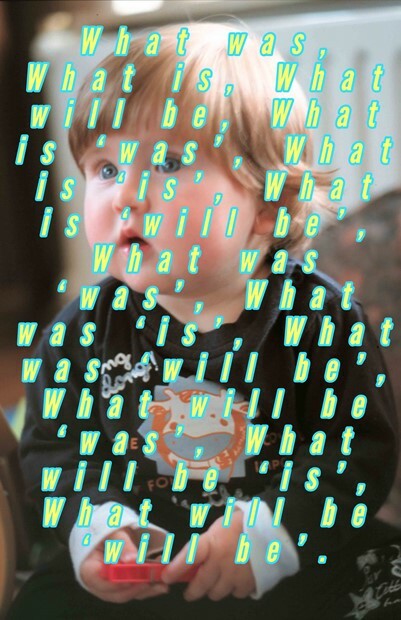 This work continues recent text based work by superimposing a text over an image of my daughter when she was 1 year old. The text is a play on the way a child might ask repetitive innocent questions, yet here , the apparent simplicity of the text belies a complex grammatical structure and philosophical propositions. The text begins by asking ‘What was?’, ‘What is?’, ‘What will be?’ but then moves into more difficult territory by asking questions such as , ‘What is ‘was’? ‘What is ‘is’’, ‘What is will be’? , as if questioning the nature of language and the notions of the past, present and future.